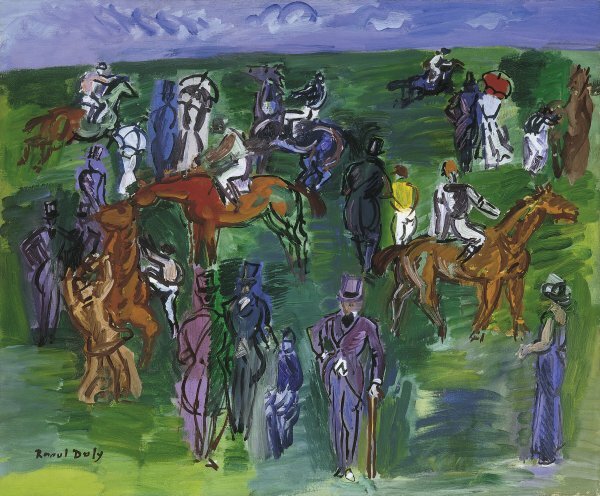 Raoul Dufy painted At the Races at the beginning of the 1930s. By then, the artist had mastered his technique and developed his own style, a cursive and spontaneous mode of expression made of commas and arabesques. He pushed to the limits his experiments on colour and light, and he took advantage of a long experience accumulated in the course of the trends, the influences he came across, the encounters made and the work carried out in the field of decorative arts. In short, when he painted At the Races, Dufy was an accomplished artist. The subject he chose to represent here is one of his key themes. Dufy is known for his races just as Vermeer is for his views of Delft, and this is no coincidence. For many reasons, races are an ideal subject, perfectly suited to the artist's experiments and the aspects he liked exploring: movement, light, and elegance. The painting is divided into two areas of colour. The first is dominated by dark green, the green of the track, and covers most of the composition. The second area, which, by opposition to the first, creates the perspective, has a blue dominant, the blue of the sky. The horizon line is thus placed very high in the composition, and our gaze is entirely attracted to the track and the characters moving on it: the jockeys dressed in bright jackets, their legs bent against the red flanks of their horses, the dandies with their tight frock coats and blue or purple top hats, and the elegant ladies, sheltered under imposing red or white parasols, dressed in long straight dresses. These figures are placed in the composition in a very homogeneous fashion. They take up all the space of the track. They all have their backs turned to us and are looking towards the horizon, except for three jockeys depicted in profile and a single figure in the centre, in the foreground, who faces us in a purple costume. All around him there is a great deal of activity. This impression is first of all due to the attitude of the characters themselves, represented in stances evoking movement. Secondly, it is reinforced by Dufy's style, which always shows great fluidity. It is also created by the dissociation between the trait and the colour, which is never enclosed within an outline. Finally, the sense of vibration is conjured up by the association of blue and green touches constituting the background. Here, harmony and dynamism, which are closely linked, are produced by the variation and the constant opposition of the colours.